میرمحمدی, علی, قدیری, مجید, آقا میرسلیم, سید مصطفی. (1395). اثر تغییر طول و فشار پاشش سوخت بر عملکرد و آلایندگی موتور دیزل سواری. نشریه پژوهشی مهندسی مکانیک ایران, 18(4), 96-114. علی میرمحمدی; مجید قدیری; سید مصطفی آقا میرسلیم. "اثر تغییر طول و فشار پاشش سوخت بر عملکرد و آلایندگی موتور دیزل سواری". نشریه پژوهشی مهندسی مکانیک ایران, 18, 4, 1395, 96-114. میرمحمدی, علی, قدیری, مجید, آقا میرسلیم, سید مصطفی. (1395). 'اثر تغییر طول و فشار پاشش سوخت بر عملکرد و آلایندگی موتور دیزل سواری', نشریه پژوهشی مهندسی مکانیک ایران, 18(4), pp. 96-114. میرمحمدی, علی, قدیری, مجید, آقا میرسلیم, سید مصطفی. اثر تغییر طول و فشار پاشش سوخت بر عملکرد و آلایندگی موتور دیزل سواری. نشریه پژوهشی مهندسی مکانیک ایران, 1395; 18(4): 96-114. پارامترهایی که امروزه نقش مهمی در عملکرد موتور و بهبود احتراق دارد، فشار پاشش سوخت و زمان‌بندی پاشش می‌باشد. این مطالعه به بررسی عددی اثرات تغییرات فشار پاشش سوخت بر آلایندگی و عملکرد موتور دیزلی در قالب شبیه‌سازی عددی توسط نرم‌افزارAVL-FIRE می‌پردازد. در این تحقیق با ثابت نگه داشتن میزان مصرف سوخت و دور موتور مدت زمان پاشش اصلی از5 الی 12 درجه میل‌لنگ تغییر داده شد و به ازای این تغییرات، آلایندگی موتور مورد ارزیابی قرار گرفت. نتایج نشان داد که با کاهش مدت زمان پاشش سوخت، میزان آلاینده دی‌اکسید نیتروژن تا حدی افزایش و آلاینده دوده کاهش می‌یابد. Kanury, A.M., "Introduction to Combustion Phenomena", Prentice Hall, Vol. 1, pp. 25-75 (1997). Abagnale, C., "Numerical Simulation and Experimental Test of Dual Fuel Operated Diesel Eengines", Applied Thermal Engineering, Vol. 65, pp. 403-417, (2014). Abagnale, C., "Combined Numerical-experimental Study of Dual Fuel Diesel Engine", Energy Procedia, Vol. 45, pp. 721-730, (2014). Makame Mbarawa, B.E.M., and Casey, R.T., "Experiments and Modelling of Natural Gas Combustion Ignited by a Pilot Diesel Fuel Spray", International Journal of Thermal Science, Vol. 40, pp. 927-936, (2001). 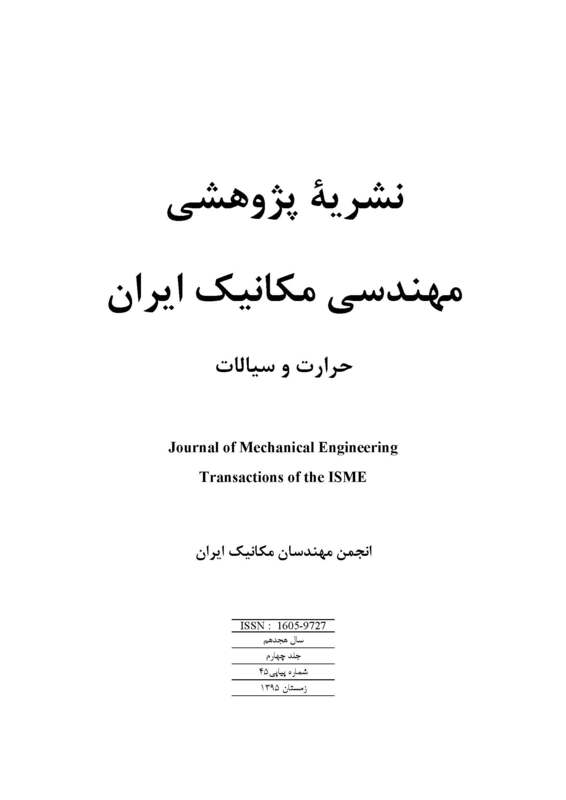 Mansour, C., "Gas–diesel (dual-fuel) Modeling in Diesel Engine Environment", International Journal of Thermal Sciences, Vol. 40, pp. 409-424, (2001). Abd Alla, G.H., "Effect of Pilot Fuel Quantity on the Performance of a Dual Fuel Engine", Energy Conversion and Management, Vol. 41, pp. 559-572, (2000). Yoon, S.H., and Lee, C.S., "Experimental Investigation on the Combustion and Exhaust Emission Characteristics of Biogas–biodiesel Dual-fuel Combustion in a CI Engine", Fuel Processing Technology, Vol. 92, pp. 992-1000, (2011). Papagiannakis, R.G., and Hountalas, D.T., "Combustion and Exhaust Emission Characteristics of a Dual Fuel Compression Ignition Engine Operated with Pilot Diesel Fuel and Natural Gas", Energy Conversion and Management, Vol. 45, pp. 2971-2987, (2004). Lata, D.B., and Misra, A., "Theoretical and Experimental Investigations on the Performance of Dual Fuel Diesel Engine with Hydrogen and LPG as Secondary Fuels", International Journal of Hydrogen Energy, Vol. 35, pp. 11918-11931, (2010). Maghbouli, A., "Numerical Study of Combustion and Emission Characteristics of Dual-Fuel Engines using 3D-CFD Models Coupled with Chemical Kinetics", Fuel, Vol. 106, pp. 98-105, ( 2013). Stewart, J., "An Experimental Study of the Dual-fuel Performance of a Small Compression Ignition Diesel Engine Operating with Three Gaseous Fuels", IMechE, Vol. 221, pp. 943-957, (2007). Duc, P.M., and Wattanavichien, K., "Study on Biogas Premixed Charge Diesel Dual Fuelled Engine", Energy Conversion and Management, Vol. 48, pp. 2286-2308, (2007). Kumar, K.S., and Raj, R.T.K., "Effect of Fuel Injection Timing and Elevated Intake Air Temperature on the Combustion and Emission Characteristics of Dual Fuel Operated Diesel Engine", Procedia Engineering, Vol. 64, pp. 1191-1198, (2013). Kusaka, J., "Combustion and Exhaust Gas Emission Characteristics of a Diesel Engine Dual- fueled with Natural Gas", JSAE Review, Vol. 21, pp. 489-496, (2000). Lee, C.S., "Experimental and Numerical Study on the Combustion Characteristics of Partially Premixed Charge Compression Ignition Engine with Dual Fuel", Fuel, Vol. 82, pp. 553-560, (2003). Selim, M.Y.E., "Sensitivity of Dual Fuel Engine Combustion and Knocking Limits to Gaseous Fuel Composition", Energy Conversion and Management, Vol. 45, pp. 411-425, (2004). Ryu, K., "Effects of Pilot Injection Pressure on the Combustion and Emissions Characteristics in a Diesel Engine using Biodiesel–CNG Dual Fuel", Energy Conversion and Management, Vol. 76, pp. 506-516, (2013). Ogawa, H., "Smokeless and Low NOx Combustionina Dual Fuel Diesel Engine with Induced Natural Gas as the Main Fuel", Engine Res, Vol. 4, pp. 1-9, (2002). McAllister, S., "Fundamentals of Combustion Processes", Springer, London, pp. 74-110, (2011). W.Boubel, R., "Fundamentals of Air Pollution", 3rd , Academic Press, USA, pp. 150-230, (1994). Ryu, K., "Effects of Pilot Injection Timing on the Combustion and Emissions Characteristics in a Diesel Engine using Biodiesel–CNG Dual Fuel. Applied Energy", Vol. 111., pp. 721-730, (2013). Baumgarten, C., "Mixture Formation in Internal Combustion Engines", Springer, Germany, pp. 152-195, (2006). Hassan S, M.N.F., "Performance and Emission Characteristics of Supercharged Biomass Producer Gas-diesel Dual Fuel Engine", Journal of Applied Sciences, Vol. 11, pp. 1606-1611, (2011).